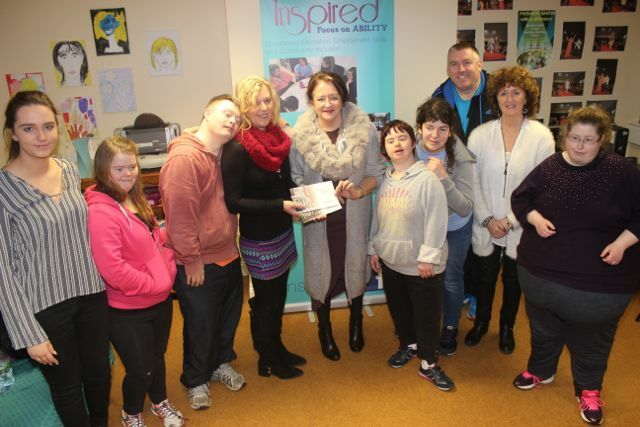 AN Abbeydorney woman won a luxury weekend for two in a top Killarney hotel thanks to the people at Inspired. The group, based in their new centre at Friary Lane, ran a Christmas raffle where they sold lines to raise funds to help run the organisation which receives no State support and relies on volunteers to provide its services. Participants in the Inspired project with an intellectual disability, aspire towards active citizenship, inclusion in the local community, contributing through meaningful work, learning relevant lifeskills,participarting in business and creating through art, craft and drama. The winner of the draw was Phil McCarthy who collected her prize at the premises on Friday. She receives two nights B&B and one evening meal for two in The Malton Hotel in Killarney. She was delighted with her prize and impressed with the services that Inspired provides. “The funds raised allow us to continue with Inspired, so it’s of huge importance to us. We’re in a new location – we moved here in October – and we’ll have an official opening on February 14,” said Yvonne O’Brien, volunteer at the centre, who thanked everyone involved in buying and selling lines for the draw.